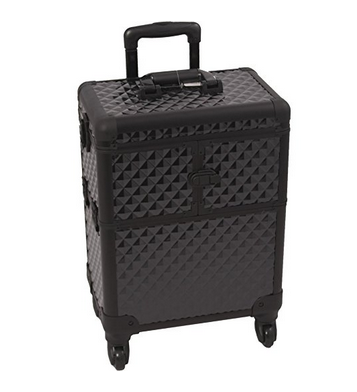 This post is for my fellow freelance makeup artists trying to decide what makeup case to use when you are traveling. For a little while I was using a Stilazzi Clear Pro Set Bag. I loved that it had many pockets & because it was clear, it was easy for me to see exactly where everything was. I travel alot so after using it for a year the plastic on the corners is really worn & has cracked. I now use it more for my hair jobs since I do more makeup than hair. I also got tired of how heavy it was on my shoulders carrying this thing up & down stairs. The strap would always dig in. Then I decided to just use a red suitcase I had at home for the meantime until I found the right case. 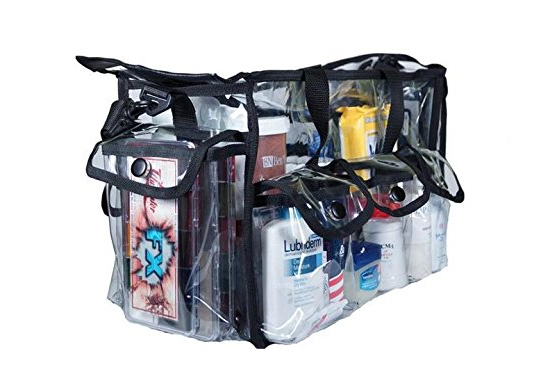 I would put all my makeup in small clear bags which I got really cheap from Ebay. So everything was organized..in one bag I had my lip liners. Another I had all my foundations & in another my lashes. It was just really time consuming when I would setup for a job. It was easy to stay organized because I kept everything in separate bags & I would just throw it in my suitcase at the end of the day. Christmas came around lol & I got a Sunrise Black Aluminum Case on Wheels. I had a case like this in pink a long long time ago when I was just 16 starting out. However the inside wasn’t sturdy whatsoever..made with really cheap plastic & it broke. It also didn’t have as many compartments as my new Sunrise Black one does. I forgot what br and the pink one was but it made not ever want to buy an aluminum case again. Anyways I hope you guys had an awesome Happy New Year & I wish you much success this year.